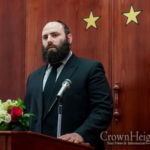 Rabbi Margolin wrote to the governments of all EU-member states requesting a change in law, reports Israel National News. Rabbi Margolin says his request is in direct response to the lack of protection of Jewish communities by European governments. The letter was sent after four shoppers were shot and killed at a kosher grocery store in Paris, and after 12 journalists were killed at the Paris publication Charlie Hebdo by Muslim extremists. “We need to recognize the warning signs of anti-Semitism, racism, and intolerance that once again threaten Europe and our European ideals,” continued Margolin. Since the attacks, France deployed 5,000 security personnel to Jewish schools, but most French Jews don’t feel protected. Why just Jews? The right to self-defense is one of the most fundamental human rights, and yet in Europe it’s completely ignored. Everyone naturally has this right; all European governments have to do is finally acknowledge it. The USA bill of rights does not create a right to be armed, it acknolwedges that all people already have that right, that it’s one of the inalienable rights that the Declaration of Independence says were granted by our Creator, and it forbids the government from infringing it. Nothing wrong with everyone having a gun. Guns don’t kill – bullets do. The right to have guns does not include ammunition. Um, yes, it definitely does. What has been downplayed in the news was that the other perp was heading towards a Jewish school until an accident blocked his route to the school. Without guns in the hands of people who have been trained to use them, there would not have been a last line of defense, Heaven Forbid. shluchim, whose houses are always the most stable, what with their open-door policies, should have guns? Ah, gun fetishists and self-defense obsessives. Always good for some delusion. Yes, they should have guns to defend themselves if necessary. If you seriously think normal people should njot have guns for fear of accidents, then first have them get rid of cars, swimming pools (even with fences), etc. That’s all we need are more guns! I sincerely pray that governments in every country crack down on illegally obtained firearms and the terrorists, criminals, and mentally unbalanced people who try to obtain them for ghastly deeds. Evil deeds must cease and get no sanction from decent peoples. Yes, more guns are exactly what we need. In the hands of normal people, instead of only terrorists, crimnals, and mentally unbalanced people. Will this make it easier for bad guys to get hold of guns? Reality is more people get killed by guns in the U.S. then in Europe. Dead is dead, no matter how. There’s nothing special about being killed by a gun. And if you adjust for demographics, crime in most of Europe is far higher than in most of the USA. Should Yidden be sitting targets, waiting to be picked off by these Jihadi animals? Do we need to remind our bretheren what happened in Europe during the 1940s? Jews should be responsibly armed and able to take care of themselves. Never Again! If the other terorrist had reached the school as he had planned, Heaven Forfend, who would have protected the children?????? Ah! Finally someone who has some sense makes a good suggestion! Well proposed! Now let’s see who has the intelligence to get the same types of laws changed in NY & NJ!!! (because if you think that this is going to only happen “over there”………. you might be in for a shock). We live on planet “earth”, not some mythical utopia, in case you haven’t realized. 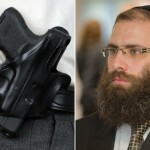 Until Moshiach comes, on planet earth, the only thing which will stop a bad guy with a gun is a good guy with a gun. Not rallies, protests, or good intentions. It’s that simple. I think that you have good intentions, but are sadly ignorant of the facts. Please educate yourself. –Sorry, but what a moron. There are approximately 300,000,000 people in the United States and there are approximately 280,000,000 handguns, shotguns, rifles and machine guns in private hands. if we……Yiddish,being ambiguous isn’t going to accomplish anything other thaN showing the world that we have unfortunately lost another intelligent casualty to political correctness and vernacular passivity. SAY IT FLAT OUT!! 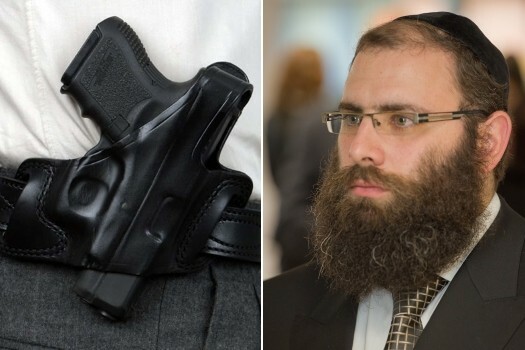 IF THE JEWS OF CROWN HEIGHTS HAD BEEN ARMED AND HAD NO PROBLEM EXERCISING THEIR G-D GIVEN, CONSTITUTIONALLY ENUMERATED RIGHT OF SELF DEFENSE, AND MADE CERTAIN THAT THE SCUM ON THE STREET KNEW IT, THEN THERE WOULDN’T HAVE BEEN THE “CROWN HEIGHTS RIOTS”!!! IT’S THAT SIMPLE!!!! WHAT IS IT GOING TO TAKE FOR FRUM JEWS TO UNDERSTAND THIS?!?! I even thought about giving them to the anti-police people. Anyway one of the kids did something stupid – how was I supposed to know how stupid someone can be? – anyway I regret that decision and wisened up real quick. I think humans shouldn’t touch those death machines. Um. I think I made a mistake. I realized that these sophisticated weapons require a high standard of training and intellectual capability to use such machinery. I’m not sure if these things are meant for every yingerleh and maiderleh.